The death toll from the weekend earthquake in the Himalayas neared 100 on Wednesday as officials warned it could rise significantly and helicopters airlifted the injured and stranded. Sunday's 6.9-magnitude quake struck the border of India's northeastern state of Sikkim and Nepal, bringing destruction to towns and villages on both sides as well as in southern Tibet. From a helipad in Mangan in northern Sikkim, military and private helicopters flew regular sorties, taking food and medical supplies to outlying villages and bringing back injured survivors and a number of foreign tourists. 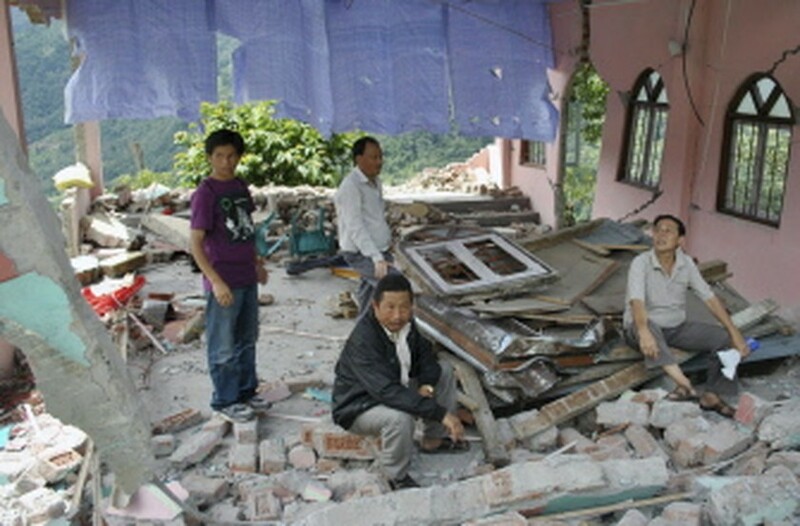 Indian villagers gather in the ruins of a church in Dikchu, some 20kms from Mangan in the north-eastern state of Sikkim on September 20, 2011, after a 6.9 earthquake struck on September 18. In the state capital, Gangtok, around 70 kilometres (40 miles) southeast of the epicentre, government official Sonam Lepcha said provisional figures put the number of dead in Sikkim at 65. "We fear that more lives have been lost, but it's very difficult to give an exact count because bodies are still being pulled from the debris," Lepcha said. Rescue efforts began in earnest Wednesday, after emergency teams and relief workers spent two days battling damaged roads and landslides to reach the quake's main impact zone. More than 5,000 troops, including army engineers using explosives, cleared a route to Mangan for trucks carrying medical teams and supplies. But access to outlying areas which bore the main brunt of the quake's impact remained very difficult and largely limited to helicopter flights. Dil Kumar Sukba, a worker in a hydroelectric power project north of Mangan, was airlifted to the main district hospital early Wednesday morning. "I ran outside the plant when the quake hit, but then my leg got trapped by a falling rock," Sukba told AFP. "I spent more than 40 hours trapped and waiting for help. I could see so many other people screaming for help but nobody was able to move," he said. D. Ekey, a doctor at the district hospital, said most of the seriously injured had badly crushed limbs and bodies after being caught in rockfalls or building collapses. Army official Sanjay Vadhera said the priority for the helicopter missions was to bring out the injured and rescue other survivors. "We have seen bodies lying under boulders, but we aren't bringing them back yet," Vadhera said. In Mangan, relatives of people living in and around the epicentre gathered in groups, sharing what little information they could glean about the fate of their family members. Most had heard nothing from their families since the quake hit on Sunday evening. Vadher said more than 40 stranded tourists, including a number of foreigners, had been airlifted to safety. Sikkim's Himalayan trekking trails are a popular adventure tourism destination. Around a million people visit Sikkim every year and an estimated 60 percent of the state's tiny population of 500,000 rely on tourism for their livelihood. In Nepal, eight people were killed and hundreds of homes destroyed or damaged in the east of the country, where rescuers faced the same problems as their Indian counterparts with rains and mudslides blocking routes to the affected areas. Eighteen other people died in the Indian states of Bihar and West Bengal, while China's official Xinhua news agency said seven people had been killed in southern Tibet, near the border with Sikkim.